Purchase with confidence knowing your payment will be processed securely with PayPal. Even if you don’t have a PayPal account you can still purchase securely through PayPal with any major credit card. These Dilithium Crystals are actually real, show used, props from the Star Trek Series. You can only get these here from the Doohan family store. 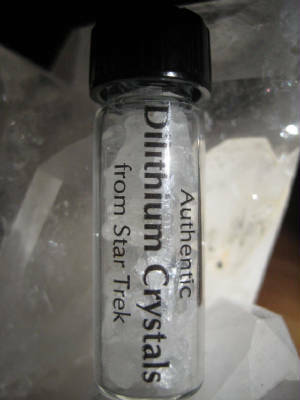 These authentic Star Trek Dilithium Crystals were actually used on the iconic television series and are only available here from the James “Scotty” Doohan Family store. Each comes with 2 Certificates of Authenticity. One from the Doohan’s and a copy of the COA from the IAW, CBS/Paramount sanctioned auction. Limited supply! Once they’re gone they’re gone! STAR TREK® STAR TREK: THE NEXT GENERATION® STAR TREK: DEEP SPACE NINE® STAR TREK: VOYAGER® AND ENTERPRISE® ARE REGISTERED TRADEMARKS OF PARAMOUNT PICTURES REGISTERED IN THE UNITED STATES PATENT AND TRADEMARK OFFICE. NO INFRINGEMENT INTENDED. SCI-FI PRODUCTS AND INDIVIDUALS WORKING FOR SAID COMPANY, ARE NOT AFFILIATED WITH IT’S A WRAP! LLC. AND CBS PARAMOUNT TELEVISION/STAR TREKTM.